Objective Several large studies have shown that improving the patient experience is associated with higher reported patient satisfaction, increased adherence to treatment and clinical outcomes. Whether physician attire can affect the patient experience—and how this influences satisfaction—is unknown. Therefore, we performed a national, cross-sectional study to examine patient perceptions, expectations and preferences regarding physicians dress. Setting 10 academic hospitals in the USA. Participants Convenience sample of 4062 patients recruited from 1 June 2015 to 31 October 2016. Primary and secondary outcomes measures We conducted a questionnaire-based study of patients across 10 academic hospitals in the USA. The questionnaire included photographs of a male and female physician dressed in seven different forms of attire. Patients were asked to rate the provider pictured in various clinical settings. Preference for attire was calculated as the composite of responses across five domains (knowledgeable, trustworthy, caring, approachable and comfortable) via a standardised instrument. Secondary outcome measures included variation in preferences by respondent characteristics (eg, gender), context of care (eg, inpatient vs outpatient) and geographical region. Results Of 4062 patient responses, 53% indicated that physician attire was important to them during care. Over one-third agreed that it influenced their satisfaction with care. Compared with all other forms of attire, formal attire with a white coat was most highly rated (p=0.001 vs scrubs with white coat; p<0.001 all other comparisons). Important differences in preferences for attire by clinical context and respondent characteristics were noted. For example, respondents≥65 years preferred formal attire with white coats (p<0.001) while scrubs were most preferred for surgeons. Conclusions Patients have important expectations and perceptions for physician dress that vary by context and region. Nuanced policies addressing physician dress code to improve patient satisfaction appear important. This is the largest study to date that examines patient preferences for physician attire. The study design and survey instrument were carefully designed to limit biases associated with physician images. The providers pictured in our survey instrument were young, slender and Caucasian, which may limit generalisability of findings. While soliciting patient responses while hospitalised helps generate validity, it is possible that reported impressions may not reflect actual preferences. Although improving the patient experience, and consequently satisfaction, is an important target for many hospitals, how best to do this is unclear. One approach is to understand how physician attire influences the patient experience and develops guidelines based on patients’ preferences. Indeed, some healthcare systems across the country have adopted stringent dress codes. In a recently published article, we contacted human resource professionals and administrators at top US News and World Report Hospitals,9 and found that five had written guidelines endorsing formal and professional attire. Yet patient preferences for physician attire are not straightforward. In a systematic review, we found that while patients preferred formal attire and white coats overall, attire such as scrubs or casual dress were preferred in specific settings.9 These findings make intuitive sense: patients often have notions of how a ‘professional’ should dress and are more likely to respond positively to those that meet these stereotypes. Strategies targeting physician dress may therefore enhance trust and satisfaction. To date, no studies have examined expressed preferences to physician attire, association to satisfaction and influencing contextual factors. Therefore, we performed a cross-sectional survey of patients receiving care across the USA using a standardised questionnaire to better understand patients’ perceived preferences of physician attire across different clinical settings (eg, hospitalised vs ambulatory clinic visits). In addition, we aimed to analyse a larger sample of patients from multiple health systems than has been previously reported in the literature. Between 1 June 2015 and 31 October 2016, a total of 6280 surveys were provided to 10 academic medical centres in the USA of which 4062 surveys were filled and available for analyses (response rate=65%). The participating sites spanned four main geographical regions of the USA. The questionnaire consisted of 22 questions and included photographs of a male and a female physician in various forms of attire. The questionnaire was administered to adult patients who were receiving care in clinics (outpatients) or admitted to the hospital (inpatients). Outpatients were approached in waiting rooms of general medicine and medical subspecialty clinics, while inpatients were approached in their hospital rooms when admitted to non-surgical units. At all sites, the questionnaire was administered by research staff using paper instruments. The surveys were administered during normal business hours at times convenient to each sites’ research staff. Respondents were allowed to request help filling out the form from any visitor accompanying them. The research staff delivered the paper instrument and returned approximately 5–10 min later to pick up the completed form. Respondents provided verbal consent. No identifying information was collected from those that completed the study. It was assumed that responses between two attire forms would be normally distributed on the 1–10 scale between attire types. An estimated SD of 2.2 was used. If our study included at least 816 patients, (assuming a two-sided alpha error of 0.05), we expected to have 90% power to detect differences for effect sizes of 0.50 on the 1–10 scale. Fewer subjects would be needed if the SDs were smaller. The study was designed to understand patient experience and preferences. However, patients were not included in the design of the survey instrument, recruitment or conduct of the study. Patients who participated did so anonymously, and therefore the study team will be unable to disseminate the results to study participants. The questionnaire was developed from a systematic review that examined the role of physician attire on patient preferences and satisfaction.9 A multidisciplinary team of psychometricians, research scientists, choice architects, survey experts and bioethicists developed the study instrument. 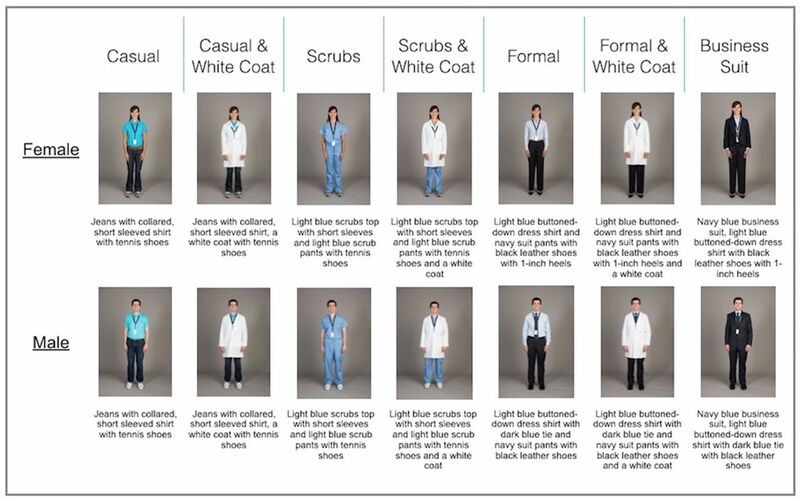 Each question sought to elicit preferences regarding various forms of physician attire, including: casual, casual with white coat, scrubs, scrubs with white coat, formal, formal with white coat and business suit (figure 1). Photographs of the same Caucasian male and female physician donning such attire were taken by a professional photographer (Scott Soderberg, Michigan Photography, University of Michigan) with strict attention to facial expressions, pose, lighting and other non-verbal cues as these may influence preference or likability. The male and female physician models were volunteer members of the research team, and each provided expressed written consent to allow the publication of their photographs. Photographs of model male and female physician in various attire used in survey instrument. To avoid bias, 14 different versions of the study instrument were created, and distribution of the questionnaires was randomised to participants. In each version, the gender and attire of the first physician model varied to prevent ordering, priming or anchoring effects (online supplementary file 1). The questionnaire had four sections: in the first section, respondents were asked to rate the physician depicted across five domains including knowledge, trust, care, approachability and comfort. In the second section, respondents were presented with seven photographs of the same physician wearing different attire and asked to select their preference in various clinical settings. The third and fourth sections sought respondents’ general opinions regarding physician attire, demographic data and frequency of interactions with physicians. Before administration, the survey instrument was pilot tested with a convenience sample of patients at the lead site to ensure photographs, questions, ratings and randomly generated order of the 14 surveys at each site would function as desired. Ratings regarding how knowledgeable, trustworthy, caring and approachable each physician appeared, as well as how comfortable the physician made the respondent feel, were measured using a 1–10 scale, where 1 indicated ‘somewhat preferred’ versus 10 ‘extremely preferred.’ Preference of attire within specific care settings (eg, primary care, emergency room, hospital, surgery and overall) was assessed using photos for each of the seven attire categories. Respondent opinions regarding importance of dress and white coats were collected using a 1–5 Likert scale, where 1 indicated ‘strongly disagree’ and 5 indicated ‘strongly agree.’ We assessed patient satisfaction based on agreement with two questions: ‘How my doctor dresses is important to me,’ and ‘How my doctor dresses influences how happy I am with the care received.’ For analyses, responses were trichotomised as follows: agreement=strongly agree and agree; neither agree nor disagree and disagreement=disagree or strongly disagree. Demographics including age, gender, education level, race and number of physician encounters were collected. Preferences for attire and demographics were dichotomised for bivariate comparison. Questions that were unanswered or where more than one response was entered were excluded. The primary outcome of interest—preference for attire—was calculated as the composite average of the five individual rating domains (knowledgeable, trustworthy, caring, approachable and comfortable). Additionally, variation in preferences for physician attire by respondent characteristics (eg, gender, age), context of care (eg, inpatient vs outpatient) and geographical region (eg, Northeast, Midwest, South and West) were also assessed. Data from paper questionnaires were entered independently and in duplicate. Since respondents were not required to answer all questions, the denominator for individual questions (and associated response rate) varied. Descriptive statistics (means, percentage) and SD were initially used to tabulate results. Differences in the mean composite rating scores from the physician ratings section were assessed using one-way analysis of variance. To reduce the potential for type I error, postestimation pairwise comparisons were performed using the Tukey-Kramer method.2 Differences in proportions for categorical data were compared using the Z-test. Bivariate comparisons between respondent age, gender and level of education and corresponding respondent preferences for attire were assessed using X2 tests. A two-sided p value of less than 0.05 was considered statistically significant. All analyses were performed using Stata V.14 MP/SE (StataCorp). A total of 4062 questionnaires were completed by patients across 10 academic medical centres in the USA. Respondents represented all parts of the USA including the Northeast, Midwest, South and West. Most patients were surveyed while admitted to the hospital (n=2616 (64%)); however, a substantial proportion of outpatients were also included (n=1446 (36%)). Respondents were most often white (71%) and male (65%). The plurality of patients was 65 years of age or older (36%). Seventy per cent of those surveyed indicated having attended some college or having college degrees. With respect to interactions with the health system, 38% of respondents reported having seen six or more physicians in the past year (table 1). 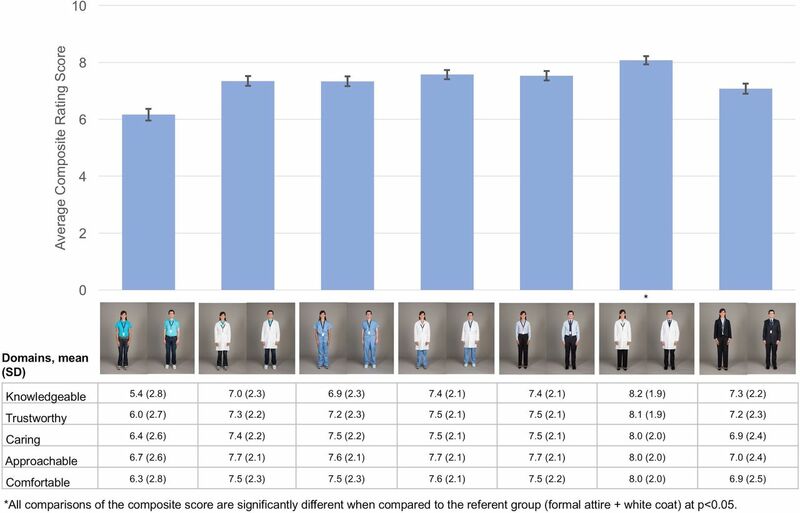 Respondents rated formal attire with white coat for both male and female physician models as the most preferred form of dress compared with other forms of attire with a mean composite score of 8.1 (SD 1.8) (all pairwise comparisons p<0.001). Cronbach’s alpha for the five items included in the composite score was 0.96. Ratings for formal attire with white coat were greatest across all domains including how knowledgeable, trustworthy, caring and approachable the physician appeared as well as how comfortable the physician made the respondent feel. Moreover, these findings were significant in the domains of trustworthiness, caring and how comfortable the physician made the respondent feel in all pairwise comparison testing to other forms of attire (p<0.05). For the rating of approachability, formal attire with a white coat was not statistically different from scrubs with a white coat or formal without a white coat in pairwise comparison. Scrubs with white coat ranked second overall, with a mean composite score of 7.6 (SD=1.9) followed by formal attire without a white coat with a mean composite score of 7.5 (SD=2.0) (figure 2). Rating of physician attire across preference domains. When examining preferences for physician attire by care setting, important differences emerged. Formal attire with white coat was preferred by respondents for their primary care (44%) and hospital physician (39%). Conversely, scrubs were rated highest for emergency room physicians (40%) and surgeons (42%). In both emergency and surgery settings, scrubs alone were followed in preference by scrubs with white coats (34% and 23%, respectively). When asked, ‘Overall, which clothes do you feel that your doctor should wear?’ most respondents preferred formal attire with white coat (44%) followed by scrubs with white coat (26%) (table 2). Excluding surgeons, respondents universally preferred physicians in white coats over no white coats. When evaluating surgeons, respondents indicated no preference for a white coat on female physicians (p=0.85), but preferred male physicians without white coats (p<0.001). No differences in preference by physician gender in other clinical care settings were noted (figure 3). 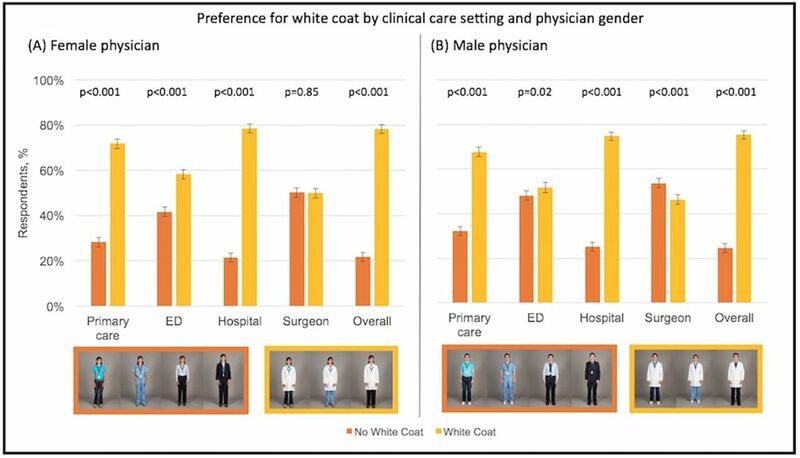 Preference for white coat by clinical care setting and physician gender. ED, emergency department. More than half (53%) of the patients surveyed agreed with the statement that how their doctor dresses was important to them, while 36% of respondents agreed with the statement that physician attire influenced how happy they were with the care they received. Views regarding appropriateness of casual attire when physicians see patients on the weekends were mixed: 44% of respondents stated this was appropriate while 56% were either neutral or disagreed with the practice. Specific questions regarding when physicians should don a white coat elicited various preferences. Most respondents (55%) indicated that they agreed or strongly agreed with the statement that doctors should wear a white coat when seeing patients in the office. In the emergency room, however, 44% agreed with the statement that physicians should wear a white coat when seeing patients versus 56% that indicated either no preference (38%) or disagreement (18%). When asked whether doctors should wear a white coat when seeing patients in the hospital, the majority of respondents (62%) agreed or strongly agreed with this statement (table 3). Important variations in patient preferences for attire were noted. For example, female respondents more often preferred scrubs with white coats in emergency room and hospital settings than males (41% vs 31% (p<0.001) and 32% vs 27% (p=0.001), respectively). However, both genders indicated formal attire with white coat was overall most preferred (43% and 44%, respectively). In hospital settings, respondents 65 years of age or older frequently preferred formal attire with white coats than younger patients (44% vs 36%, p<0.001). Conversely, younger patients more often preferred scrubs and white coats than formal attire overall (28% vs 21%, p<0.001). Some differences in preferences regarding physician dress based on respondent education level were also noted. Specifically, respondents with a college degree preferred formal and white coat for their primary care provider more often than those without a college degree (48% vs 42%, p<0.001). No differences in preferences between those with three or more physician visits in the preceding year versus those with less frequent visits were noted. Similarly, preferences for attire did not vary by setting in which respondents were polled, although respondents in the outpatient setting more often preferred doctors in the hospital to wear scrubs and a white coat compared with hospitalised respondents (32% vs 27%, p=0.002). However, preferences for attire did vary by geographical region. For example, while formal attire and white coats were preferred across all regions, 50% of respondents in the West and 51% in the South selected this as their preferred option compared with 38% and 40% in the Northeast and Midwest, respectively. Conversely, over half of all respondents in the Northeast selected scrubs as their preferred attire for surgeons compared with a quarter of respondents in the South (54% vs 25%, p<0.001). This study of over 4000 patients receiving medical care in diverse academic medical centres is the largest to report preferences regarding physician attire in the USA. Over half of the participants indicated that how a physician dresses was important to them, with over one in three stating that this influenced how happy they were with care received. Overall, respondents indicated that formal attire with white coats was the most preferred form of physician dress. However, in settings such as surgery or emergency rooms, scrubs with white coats were most preferred. Although variation in preferences by respondent age, gender, education and geography were noted, these findings indicate that most patients have expectations regarding doctor attire, and that a ‘professional’ look matters most. Given the size, methodological rigour and representativeness of these data, policies addressing physician attire should be considered to improve patient satisfaction. Previous studies have shown that patients harbour conscious and unconscious biases when it comes to provider dress.10 11 Thus, our finding that patients have specific preferences regarding physician attire was not surprising. What this study highlights, however, is the potential importance of physician attire to the physician–patient relationship. Indeed, specific clinical and contextual aspects appear to influence a patient’s preconceived notion of ‘professional attire’. For instance, we found that the locale where care is delivered (eg, hospital vs clinic) as well as context of care (eg, emergency room or surgery) affected preferences. Similarly, we observed that certain respondent characteristics such as age, gender and education also influenced their preferences. These findings can potentially be used to improve the patient experience. For instance, providers engaged in care of elderly patients (eg, geriatric clinics, hospital settings or extended-care facilities) may consider donning formal attire more so than surgeons or emergency room physicians where scrubs may be more important. Similarly, hospitals in Southern regions of the USA may wish to endorse formal attire and white coats as their preferred policy. For providers in the emergency room and surgical arenas, such attire may in fact be viewed as out of place—and thus different rules might be necessary. These examples illustrate how policies for specific doctors, settings or patients can be leveraged to focus on patient-centred care. Our study has limitations. First, as with other studies of physician attire, we showed respondents pictures of providers and elicited preferences via a paper questionnaire. Our providers were young, slender, Caucasian and all cared for in academic settings, which may have introduced bias into responses. Similarly, we did not record information for patients who refused to participate in the study, also potentially introducing bias. Second, while approaching patients as they were receiving care helps generate validity, it is possible that reported impressions may not reflect actual preferences on attire but rather current feelings related to their care. Prior studies have shown that the potential impact of attire on patient satisfaction has to be considered in the context of the behaviours and attitude of the physician during the encounter. The survey did not have questions to capture the other dynamics of the doctor–patient relationship, which may help further explicate responses.9 Third, we asked patients to report preferences via Likert scales and predefined categories. Although this allows for a range of answers (including a neither agree nor disagree option), such categorisations may force respondents to answer in ways that do not capture their true feelings. Fourth, while the proportion of Caucasian respondents were similar to 2010 Census data estimates, a lower than expected number of Hispanic respondents (5% compared with 16% estimated by the Census data) participated.52 Thus, whether our findings will hold true across race or ethnicity is not known. Finally, we did not include questions regarding infection transmission given the lack of evidence supporting the notion that white coats or attire is associated with infections. Our study also has important strengths. First, this is the largest study to examine patient preferences for physician attire. Given methodological strengths including randomisation of instrument sequence, as well as inclusion of diverse regions and patient populations, our findings clarify possible dress codes in various healthcare settings. Second, in contrast to other studies, we specifically designed our study and survey instrument to avoid biases associated with images. For example, we hired a professional photographer and studio to ensure photographs of physicians were otherwise identical. Similarly, we also used models of the same race (Caucasian) with identical postures and facial expressions so as to limit confounding associated with models of different backgrounds or appearance as has occurred in previous studies.29 36 37 39 45 Additionally, we implemented strategies during survey collection such as randomising order of delivery and images to minimise bias. These approaches help to lend a high degree of internal validity to our findings. Third, our findings have policy implications: namely, patients appear to care about attire and may expect to see their doctor in certain ways. Hospitals, clinics, emergency departments and ambulatory surgical centres should consider using these data to set dress codes for physicians providing care in these settings. In summary, while physician attire cannot replace excellent clinical care, our data suggest that it may influence how patients perceive care and perhaps how willing they are to trust their doctors. In an era of patient centredness and patient satisfaction, physician attire may be an important, modifiable component of patient care. As perceptions and expectations regarding physician dress by patients, context and region exist, nuanced policies that target such factors appear relevant. Future studies implementing such policies in both hospital, clinic and emergency room settings appear necessary. The authors thank the following contributors who helped with data collection for this study at their respective sites: Dr Rachel Thompson, Dr Rajesh Patel, Dr Gabrielle Berger, Dr Daniel Cabrera, Dr Nancy Dawson, Dr Mary Ann S. Hedges, Dr Talawnda Bragg, Mr. Aditya Yelamanchi, Ms. Scarlett Shader, Ms. Anaiah Massey and Ms. Sabian Taylor. Additionally, the authors would like to acknowledge Natalie Boe for her assistance with photography and Jennifer Petrilli for managing the photography sessions. Medicine Io. Crossing the Quality Chasm: A New Health System for the 21st Century. Washington, DC: National Academy Press, 2001:6. Services TCfMaM. The HCAHPS survey - frequently asked questions. 2017 https://www.cms.gov/Medicare/Quality-Initiatives-Patient-Assessment-Instruments/HospitalQualityInits/Downloads/HospitalHCAHPSFactSheet201007.pdf (accessed 4/28/2017).
. Relationship between patient satisfaction with inpatient care and hospital readmission within 30 days. Am J Manag Care 2011;17:41–8.
. Dress for Success: How Clothes Influence Our Performance. Scientific American, a division of Nature America, Inc, 2016.
. How a team of doctors at one hospital boosted hand washing, cut infections and created a culture of safety: Yahoo News. 2014 https://www.yahoo.com/news/clean-hands-vanderbilt-s-hand-washing-initiative-172312795.html (accessed June 12, 2017).
. Patients' preferences for physicians' attire in Saudi Arabia. Saudi Med J 2012;33:763–7.
. Dress and address: patient preferences regarding doctor’s style of dress and patient interaction. Ir Med J 2008;101:211–3.
. Hospitalised patients' views on doctors and white coats. Med J Aust 2001;175:219–22.
. [Clothing make the doctor--patients have more confidence in a smartly dressed GP]. Ned Tijdschr Geneeskd 2010;154:A2898.
. Putting on the style: what patients think of the way their doctor dresses. Br J Gen Pract 1991;41:75–8.
. The physician’s appearance. Fam Med 1991;23:208–11.
. The Doctor’s New Clothes: Professional or Fashionable? Primary Health Care 2014.
. Patients' perception of military doctors in fracture clinics--does the wearing of uniform make a difference? J R Nav Med Serv 2005;91:45–7.
. Factors affecting therapeutic compliance: A review from the patient’s perspective. Ther Clin Risk Manag 2008;4:269–86.
. Overview of Race and Hispanic Origin: 2010. Maryland: United States Department of Commerce EaSA, U.S. Census Bureau, 2011. Contributors Conception and design of the work: CMP and SS. Acquisition of the data: VC, JJJ, LK and CMP. Analysis and interpretation of the data, drafting and critical revision of the manuscript for important intellectual content, accountable for all aspects of the work and approval of the final manuscript: AC, VC, JJJ, LK, CMP, SS and AS. Ethics approval The study was reviewed and deemed exempt from regulation by the University of Michigan Institutional Review Board (HUM00085305). Data sharing statement Additional unpublished data are not publicly available. Collaborators Dr Rachel Thompson, Dr Rajesh Patel, Dr Gabrielle Berger, Dr Daniel Cabrera, Dr Nancy Dawson, Dr MaryAnn S. Hedges, Dr Talawnda Bragg, Scarlett Shader Anaiah Massey, Aditya Yelamanchi and Sabian Taylor contributed by collecting data at their respective sites, PhD assisted with the design of the survey instrument and statistical analysis plan assisted with the design of the survey instrument. Author note The views expressed in this article are those of the authors and do not necessarily reflect the position or policy of the Department of Veterans Affairs or the US government.